“Donna in the News” is my reporting of newly found newspapers articles and advertising regarding my grandmother, Madonna Montran (aka Donna Montran and aka Donna Darling). I am always excited when I learn of a new venue for my grandmother’s exciting show business career of the 1910s and 1920s. Another great week of Donna in the News with three new venues discovered and an intriguing note about Donna having been in a train crash. The Rock Island Argus (Rock Island, Illinois) newspaper dated 29 March 1924 shows that Donna Darling and company played in a song and dance revue at the Fort Armstrong theatre. In another article, from March 31st, the paper indicated that she missed her first show at the Fort Armstrong because of a train crash. I wonder how bad of a crash was it? The crash has the potential of making another great story. I’m looking forward to additional research. Next, is an ad from the News Record (Neehah, WI) newspaper dated 5 December 1924. The ad shows that the California Motion Picture Bathing Beauties, featuring Donna Darling played at the Neehah theatre on December 8 & 9. Finally, from the The Record (Hackensack, NJ) dated 23 February, I learned that Donna Darling and Company played at the Lyric Theatre in Hackensack, for three days beginning February 24th. The show is the “Donna Darling and Girls”. Head balancing Act Also on Vaudeville Program for This Week-End. The Cecil theater vaudeville program is to be given today and Sunday shows more than ordinary promise. The five stage acts from the Orpheum circuit include several that should appeal to Mason City theater goers. The Cecil will have a pretentious headliner on the vaudeville stage today in Donna Darling and Girls in songs and steps, a bevy of beautiful musical comedy beauties in the presentation of the latest songs and dances. Miss Darling is a former star with Flo Zeigfield and Chin Chin revue and is assisted by a number of lovely young women who present a routine of the latest popular catchy song numbers and also the latest dances. Special stage setting enhance the beauty of the offerings. Luckily, the article mentions Mason City and a search found there are three places with the name, only Mason City, Iowa had a Cecil theater. A search of IMDB found that “Ramshackle House,” starring Betty Compson was released on 31 August 1924. Movies at that time typically only had a three or four-month life, so I expect that Donna’s show at the Cecil probably took place in between September and December 1924. Very little is known about Donna’s schedule in 1924. She probably played in Louisville, Kentucky in August, and Wisconsin in November and December. So, she was definitely in the right part of the country to have played in Mason City in September, October, or November 1924. A search of Newspapers.com, Genealogy Bank, Newspaper Archives, Ancestry, Chronicling America, Old Fulton Postcards and other sites suggested by The Ancestor Hunt yielded nothing to further identify exactly when Donna played in Mason City. Additionally, Chronicling America does not indicate that any libraries include holdings of “The Mason City globe-gazette and Mason City daily times” for 1924. Determine what repositories may have archive records of 1924 “Mason City globe-gazette and Mason City daily times” newspapers that were published from 1918 to 1929. This photo of Donna Darling up in lights had no accompanying descriptions in the Donna Darling Collection. So, let the detective process begin. First, I determined that this was the B.F. Keith’s Greenpoint Theater located at 825 Manhattan Ave., Brooklyn, NY. Cinema Treasures had several photos of this theater at various times. From the architecture, it is evident this is the same theater, also known as the RKO Greenpoint theater that was at 825 Manhattan Ave, Brooklyn, NY. Next, I was interested in when this photo was taken. According to Wikipedia, The silent film “For the Defense” was released in 1922. For more detail, I needed to zoom in. The play board in front of the theater indicates that the movie. In vaudeville, typically any live shows ended the same date that a silent movie ended. So, I’m pretty sure that Donna played B.F. Keiths the week preceding May 18th. Donna Darling and Company played B.F. Keith’s Greenpoint Theater the week of 11-17 May 1922. I need to do more research for the specific dates Donna was at this theater. I also need to research what happened to the theater. I have long known that “Chin Chin” played on 20 March 1920 at the Laird Opera House – in Greenville, PA and that they played at the Sandusky Theatre in Sandusky, OH on April 5th, but the 16 days between was a mystery until I searched Genealogy Bank. I now have one more date and location for Donna’s vaudeville career — The Grand Opera House in Canton, Ohio. The first advertising I see for “Chin Chin” appears to have been on March 26th where there was a small notice of booking and a small advertisement for the show. “Chin Chin,” in which Cantonians saw Doyne and Dixon several years ago, probably is like no other stage production ever conceived. It is just as coherent as its name and it is full of surprises for the beholder. One unusual stage feature follows another rapidly, while pretty girls and catchy music are plentifully interspersed. That paragraph is followed up with a major article (7 paragraphs) elsewhere on the page titled: “CHIN CHIN” WILL SHOW AT GRAND.” The article doesn’t provide any new information but does highlight many of the acts and songs. There is also a substantial ad on page 45. Donna was a beautiful woman. Different sources provide different Seating capacities from 1,000 to $1,400 over the years. I use 1,218 as my preferred capacity: Floor, 550; Balcony, 320; Gallery, 300; Boxes, 48. [iii] It had a 36×28 foot stage. In 1920, the Thomas Waltenbaugh managed the Grand Opera House. The Grand had already begun showing movies by 1920. The week that “Chin Chin” played at the theater, the silent film, “Mary’s Ankle” starring Douglas MacLean and Doris May showed every other day that week. It appears that by April of 1920, the theater was still trying to bring in high-class live shows, but when they couldn’t, they showed silent films. Like so many of the grand theaters of the time, the Grand began a slow decline as it showed movies and presented burlesque shows. 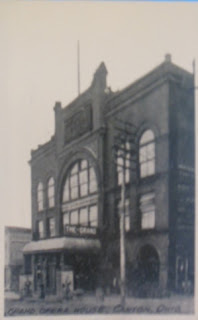 Bethel Tabernacle bought the Grand Opera House in 1946. What Donna and the “Chin Chin” case would have seen – a full house. [i] “Repository” (Newspaper) (Canton, Ohio) – 2 April 1920 – Page 14 via Genealogy Bank. Emphasis mine. [ii] Web: Joseph N. Rubin Productions – Grand Opera House – https://sites.google.com/site/josephnrubin/grandoperahouse – Accessed 3 September 2016. [iii] The Cahn-Leighton Official Theatrical Guide 1913-1914 – Page 510 – via Google.